Let us help you determine what you need. 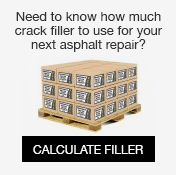 Asphalt Kingdom's Parking Lot Paint Calculator lets you know how many gallons of paint you'll need for your line painting job. All you need to know is how many linear feet you'll be painting. Input which paint you would like to use, and you get an instant quote for how much the paint will cost you, as well as how much leftover paint you will have for your next job! Knowing exactly how much paint you’ll need for your parking lot lines ensures that you won’t run out of paint before all of your lines are painted. Learn how to measure the lines of all your parking lot stalls with this quick guide. If you’re a parking lot contractor or a business owner with your own parking area, having a measuring wheel is important. Our measuring wheel has a telescoping handle that lets you walk the wheel without having to bend over; all you have to do is measure your existing lines by rolling the wheel over them. The measuring wheel’s result will show you exactly how many linear feet you will be painting. Input that value into the paint calculator above and it will show you how many gallons you will need. 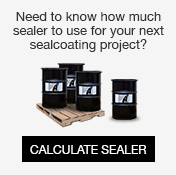 By knowing exactly how many gallons you’ll need for each job, you’ll know exactly how many containers of paint you’ll need. Asphalt Kingdom’s durable traffic paint is available in 5 gallon pails and generally offers 320 linear feet of coverage per gallon. Our water-based paint is legal to use in all 50 states, and we now offer a Pro version that dries in 10 to 15 minutes. We also offer oil-based paint, but there are state restrictions (if your state is on the restriction list, simply go for the water-based paint). Both paint types are specially formulated to work on asphalt and certain concrete surfaces. Reflective beads can be used with our paint. If you have a brand new parking lot without any parking lines or you want to redo your lines completely, you’ll have to lay out new parking stalls. If you work in a crew, a stand-alone chalk line reel may help. If you aren't sure of how many feet you'll be striping, or if you'd like help deciding between oil-based or water-based paint, contact our friendly asphalt line striping experts. They'll be happy to help! You can reach them via phone, toll-free at 1-866-299-5562, or by email.